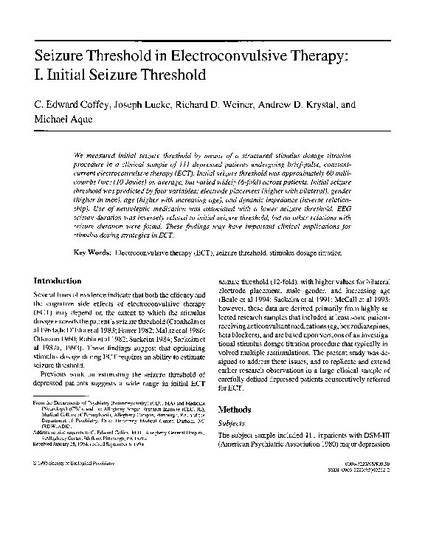 We measured initial seizure threshold by means of a structured stimulus dosage titration procedure in a clinical sample of 111 depressed	patients undergoing brief-pulse, constantcurrent electroconvulsive therapy (ECT). Initial seizure threshold was approximately 60 millicoumbs (mc) (10 Joules) on average, but varied widely (6-fold) across patients. Initial seizure threshold was predicted by four variables: electrode	placement (higher with bilateral), gender (higher in men), age (higher with increasing age), and dynamic impedance (inverse relationship). Use of neuroleptic medication was associated with a lower seizure threshold. EEG seizure duration was inversely related to initial seizure threshold, but no other relations with seizure duration were found. These findings may have important clinical implications for stimulus dosing strategies in ECT.